NASA's Dawn spacecraft captured this photo of Ceres on May 16, 2018, as it approached its lowest orbit ever of the dwarf planet in the asteroid belt. At the time of this photo, Dawn was about 270 miles (440 kilometers) from Ceres. A NASA spacecraft is about to get up close and personal with Ceres, a giant asteroid that also happens to be the only dwarf planet in the inner solar system. This month, NASA's Dawn spacecraft will shift into an orbit that will skim just 22 miles (35 kilometers) above Ceres at its closest point, allowing Dawn to get its best views yet of the dwarf planet. At its farthest point, the new elliptical orbit will carry Dawn out 2,500 miles (4,000 kilometers). One target on Ceres is especially tantalizing during the new, lower orbit. That's Occator Crater, a place with strange, bright white spots. "As a bonus objective, scientists would like to study the elements in one of their favorite places (and perhaps one of yours as well): Occator Crater, site of the highly reflective salt deposits, famous not only on Ceres but also on Earth and everywhere else that readers follow Dawn's discoveries," Marc Rayman, mission director and chief engineer for Dawn at JPL, wrote in an April 29 blog post. "Studying this one crater and the area around it (together known as a geological unit) could reveal more about the complex geology there." At its lowest point, Dawn will be 10 times closer to Ceres than the probe has ever been. In fact, Rayman said it will be the closest Dawn has been to an object in the solar system since it launched from Earth. "The last time it was that close to a solar system body was when it rode a rocket from Cape Canaveral over the Atlantic Ocean more than a decade ago," he said. This NASA diagram shows the initial orbit of the Dawn spacecraft around Ceres (outer green ellipse) and its near-final orbit (center green ellipse), with the blue lines indicating the probe's path in between. In addition to photos, Dawn will use its instruments to understand the chemical composition of the top layer of Ceres' surface. The Dawn spacecraft has been orbiting Ceres in the asteroid belt (between the orbits of Mars and Jupiter) since March 2015. NASA launched the mission in 2007, sending Dawn first to the large asteroid Vesta — the second largest object in the asteroid belt after Ceres — before moving on to Ceres itself. Dawn is equipped with a fuel-efficient ion drive that allowed it to fly between asteroids. In 2016, the probe went into a high orbit above Ceres to study the dwarf planet from a distance that ranged between 2,800 miles (4,400 km) and 24,300 miles (39,100 km). 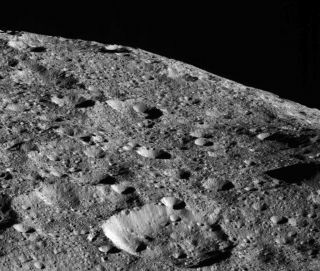 Dawn spent much of the last year in that orbit and began lowering its path around Ceres on April 16 of this year, Rayman said. Finding an orbit that would both get close to Ceres and allow for good science observations was a challenge for mission engineers, NASA officials said. Engineers ran through more than 45,000 potential variations before hitting on one that worked. NASA's $466 million Dawn mission is in its second extended phase and will end its days in orbit around Ceres. After launching in 2007, the spacecraft headed to Vesta and spent a year orbiting that asteroid (from 2011 to 2012).